For many years, not a great deal was known about Maud’s personal life. Her childhood was spent with strict, undemonstrative grandparents, and her reflections on writing, her lifelong struggles with anxiety and depression, her "year of mad passion," and her difficult married life remained locked away, buried deep within her unpublished personal journals. Through this revealing and deeply moving biography, kindred spirits of all ages who, like Maud, never gave up "the substance of things hoped for" will be captivated anew by the words of this remarkable woman. 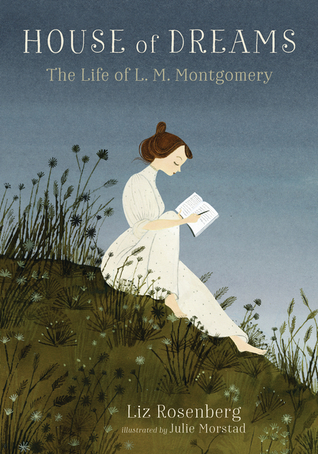 We’ve all heard of Anne of Green Gables and other novels by famed author L. M. Montgomery. I remember watching the series with Megan Follows and loving it, my initial impression was that the author shared the same personality traits as Anne did. Right from the beginning I was captivated with the story of Montgomery's life and going in with no inclinations of what to expect I was blown away with her story. From her childhood right to her final years Liz Rosenberg used personal journals to write this book. This is non-fiction for young adults and was illustrated very nicely. It was her adult years that really stood out for me and you could say I was saddened with all she went through, it wasn't a time when women could be independent but Montgomery endured so much to follow her dreams. The author wrote an in-depth story of what life was like in the late 1800's early 1900's until Montgomery’s end in 1942. There were a few times I got confused with the back-and-forth of time and sometimes I wondered if the frank talk about depression and it’s behavior (suffered by both wife and husband) might be too much for a younger reader. I would have loved to see photos but given this was an advanced ebook they might appear in the print version. I feel with all Montgomery went through and getting to know her better my desire to read more of her books has definitely peeked. Especially knowing her frame of mind while writing them. My sincere thanks to the publisher (via Netgalley) for an advanced copy in exchange for honest review.